Hi Everyone, welcome back. Today I’m going to discuss the top 10 causes for hair loss that should not be overlooked. Female hair loss can be a complex and frustrating issue. It’s also one of the most stressful symptoms that my female patients can experience. As a naturopathic doctor and functional medicine provider, my goal is to figure out the underlying causes for a patient’s hair loss. And in most cases, there are multiple factors involved. I wanted to create this video to provide more information about some common but often overlooked causes for female hair loss. The most common type is hereditary – also known as female pattern hair loss or adrogenetic alopecia. In this type of hair loss, hormone receptors on the follicles are more sensitive to a potent form of testosterone called dihydrotestosterone, which is abbreviated DHT. Over time, this hormone interaction produces smaller hair follicles that result in thinner and finer hair. Other hormones are also thought to play a role since many women experience hereditary hair loss after menopause although some women may notice hair loss much younger. The pattern of hair loss or thinning is generally seen throughout the top of the head, and sometimes near the temples. And we don’t typically see excess hair shedding with female pattern hair loss. I think it’s important to know that even though this type of hair loss is considered “hereditary” or “genetic” – there is still a lot you can do to optimize health and hormone balance to prevent hair loss. The next type – Telogen effluvium is a temporary hair loss that is triggered by a shock to the system such as child-birth, surgery, medication, toxicity, malnutrition or even psychological stress. Telogen refers to the resting or shedding phase of the hair cycle. Now, normally, we have about five to ten percent of our hair in this resting stage. With telogen effluvium, approximately thirty percent of hair can enter the resting stage which results in a LOT of hair shedding. It’s important to know that the hair loss is delayed and can start anywhere from 6 weeks to 3 months after the stressful event and can be considered acute or chronic. In acute telogen effluvium, the excess hair shedding will resolve within 6 months and it can take about a year for the hair to re-grow. If the source of the stressor is not addressed, the hair shedding can continue and result in chronic telogen effluvium. In this case the hair loss can continue for years. Now, in the case of child-birth or surgery, it’s easy to identify the trigger for telogen effluvium. But when it comes to toxins, chronic infections and nutrient deficiencies, the cause can be more difficult to identify. This is where functional lab testing can be helpful to identify the underlying cause. The third type of hair loss the I want to cover is Alopecia areata. This is an autoimmune condition where the immune cells mistakenly attack the hair follicles. This has a distinct appearance with one or more round patches of hair loss. It can spread to the entire scalp which is called Alopecia totalis – and if the hair loss affects the scalp and body, its known as Alopecia universalis. Finally, ophiasis is a form of alopecia areata that occurs in a wave pattern around the hair line – typically seen at the back of the neck. It’s also important to know that different types of hair loss can coexist. For example, some women will have a stressful event that triggers Telogen effluvium that unmasks a female pattern hair loss. This is why I find it so important to evaluate all of the potential factors that can lead to hair loss. So, whether or not you’ve been diagnosed with a specific type of hair loss, here are ten important factors to consider. First, we have to look at hormones – this is especially important for those with androgenetic or androgenic alopecia. Healthy levels of blood sugar and insulin are extremely important for our other hormones to be in balance. For example, insulin resistance in females can contribute to the androgen or male hormone excess that we see in polycystic ovarian syndrome. One of the common symptoms of PCOS is hair thinning. It is also known that starting or stopping hormonal birth control can lead to hair loss. And many women experience post-partem hair loss which may be due to a combination of hormone fluctuation and stress on the body. Number two – includes scalp infections. If you have a lot of itching or irritation on the scalp, it can be helpful to see a dermatologist to rule out a yeast or bacterial infection. Number three – thyroid conditions, especially hypothyroidism. Methimazole, which is a treatment for hyperthyroidism can also cause hair loss. Number four – Intense emotional stress such as the loss of a loved one can be a trigger for telogen effluvium. Number five – Physical stressors such as eating too little, injury or surgery, especially weight-loss surgery can be a cause for hair loss. Number 7 – Toxic exposures including heavy metals such as thallium and mercury are well-known to cause hair loss. Other toxic metals and compounds that have been linked with hair loss include arsenic, lithium, cadmium, aluminum, lead and boric acid. In my practice, I’ve also seen a connection between mold toxicity and hair loss. Number 8 – Many of us are aware that anti-cancer drugs can cause hair loss, but a lot of other common medications are linked with hair including antibiotics, antifungals, acne medication, antidepressants, cholesterol medications, things that affect blood-flow such as blood thinners, beta blockers and calcium channel blockers. Colchicine, a medication typically used for gout is well-known to cause hair loss. I was really surprised when I learned that NSAIDS such as aspirin, ibuprofen and naproxen are also linked with hair loss. One thing to remember with medication is that the hair loss is delayed and can start 3 months or more after starting the medication. Number 9 – Nutrient deficiencies – the most common nutrient deficiencies that are linked with hair loss include iron, zinc, vitamin D and biotin. Insufficient protein intake can also lead to hair loss. Several other nutrient deficiencies that can affect our hair include vitamins A, C and E in addition to B-complex vitamins, magnesium, selenium and essential fatty acids including omega 3’s. It’s also important to know that TOO MUCH iron, vitamin A, copper and selenium have also been linked with hair loss. This is why testing for nutrient levels is so important. Number 10 – Environmental factors including air pollution and radiation. I don’t think this gets considered very often, but air pollution can contribute to scalp irritation and hair loss. Multiple compounds found in particulate matter can adhere to hair shafts and cause damage. One study also linked hair loss with cell phone radiation. The patient had noticeable hair thinning on one side of the head. They reported using their cell phone 6-7 hours per day for work. There is actually some research to suggest that cell phone radiation causes DNA damage of the hair root cells. The good news is the hair loss was temporary and grew back after the patient completed a hair care program and switched to a hands-free option. I really like the air-tube headphone options to reduce radiation exposure with cell phones. For anyone interested in the research, I’ve provided the links below. I hope you found this helpful. 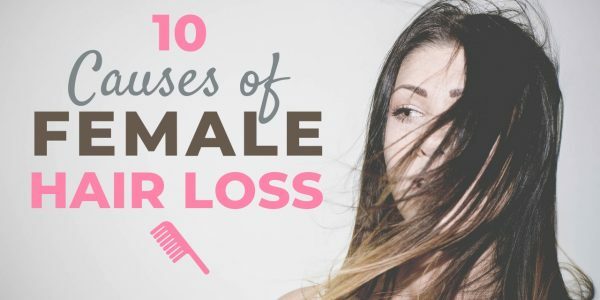 Again, I usually find that there are multiple factors involved in female hair loss. It’s also important to be patient with hair re-growth. It can take some time. If you’re interested, I could do another video discussing some of my top treatments for hair loss. Feel free to comment below! Thanks for watching!